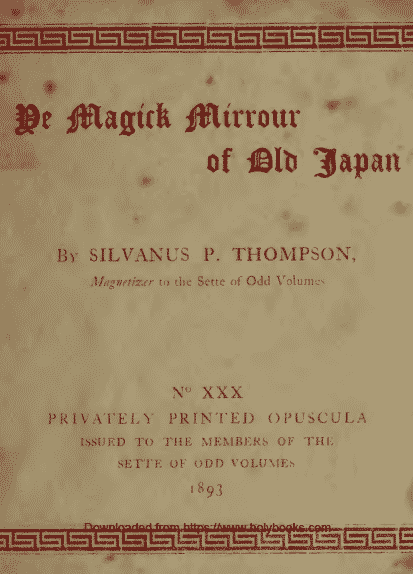 Ye Magick Mirrour of Old Japan is a very special little book about the Japanese tradition of sacred mirrors. The book was privately printed in 97 copies and it is based on a discourse delivered at a Meeting of the Sette holden at Limmer’s Hotel (from where we also got the Limmer’s Gin Punch) on Friday, December 2, 1892. 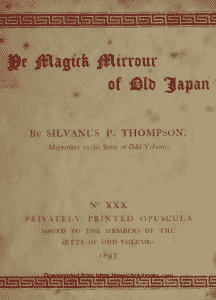 In Japan mirrors had a peculiar place in society and spirituality. Mirrors were often decorated and surrounded with flowers like we see icons from the West decorated, and some of them are told to have magical properties. This book digs into the special properties. It seems that due to an old technique some Japanese mirrors can present patterns or images, not to the onlooker but at the mirror’s reflection in the room, if the light source is just right.